A great, low-priced super-automatic machine with tons of potential. Recommended for: People with small kitchens or limited counter space. Anyone on a budget. Not recommended for power drinkers, who will need a machine with a larger water reservoir. Are you interested in exploring the fantastic world of specialty coffee drinks, but just don’t have the budget to buy one of the fancy, high-end machines with all the bells and whistles? Are you short on space, and looking for a super-automatic that can fit onto whatever counter space you’ve got? If you answered yes to either of those questions, then keep reading, because you’re going to love our detailed Gaggia Brera espresso machine review. It’s a “fun-sized” super-automatic espresso maker that is surprisingly full-featured and will enable you to make a wide variety of specialty drinks without breaking the bank, or requiring an advanced degree in computer science to learn how to use! Given that this is a value-priced machine, it’s obviously going to have certain limitations, but by the time you reach the end of this review, we think you’ll agree – for the money, you’ll be hard-pressed to find a better machine than this! 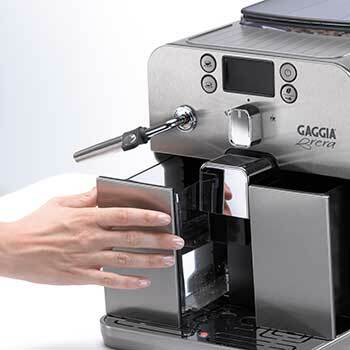 As we indicated in the introduction, the Gaggia Brera coffee machine isn’t very big, with dimensions of just 10” x 15.5” x 11.5,” and weighing just 19 pounds. Part of the reason that it’s so lightweight is the fact that it’s made from sturdy ABS plastic, with metal just where it’s needed most (the drip tray, boiler, steam wand, and spigots). It’s expressly designed with a small footprint so as to fit right into small kitchens, making it ideal for people with limited counter space or low clearance between your countertops and your cabinets. The Brera comes in two color options. You can either get it in all silver or with a silver front face and black side panels, depending on which you think would look better in your kitchen. While some designers go out of their way to give their machines a stylish, elegant look, it’s clear that the Brera’s designers valued function over form. It’s not an unattractive machine, it’s just understated, with clean lines and efficient design. We’ve got mixed feelings about this, but that’s mostly because we’re power coffee drinkers and tend to prefer machines with big water tanks. Being a fun-sized machine obviously limits the amount of water the Gaggia Brera automatic espresso machine can realistically hold, and it does pretty well in that regard, with its 41-ounce reservoir. Sadly, although we do like the machine, that fact alone removes it from contention in our office. We’d be stopping to refill the tank on an almost constant basis! Having said that, if you’re not a power coffee drinker, and if you have a small household, then the relatively small size of the water tank probably won’t be an issue for you. It’s just one of the tradeoffs that come with the small size of the machine. Note: Although this model doesn’t come with a water filter for the reservoir, it is designed to accommodate one. If you want to use one though, you’ll need to buy it separately. There are two sides to the use of water filter. On the one hand, we completely understand why some people want to use a filter on their machines, because doing so virtually eliminates the need for descaling, and that means less time spent doing machine maintenance. On the other hand, having to buy filters periodically will increase the total cost of ownership of the machine, which isn’t so great. And, if you’ve got a water filter in your sink, or if you use distilled water when you make coffee, you can reap the same benefits the filter would provide anyway. There are no right answers here. Ultimately, it comes down to your personal preference, and whether you’ve got access to filtered or distilled water. The water tank is super easy to get to because it’s front loading, which again, makes it ideal for people who have low clearance between their countertops and cabinets. Kudos to Gaggia for that! 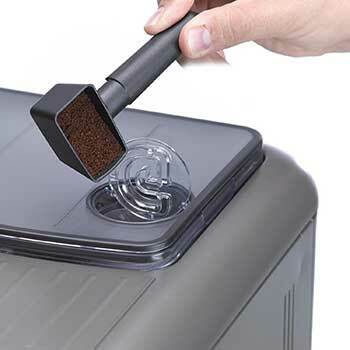 Most value-priced machines use stainless-steel grinders. That’s problematic because they tend to heat up when used, which can burn your grounds and utterly ruin the taste of your coffee. 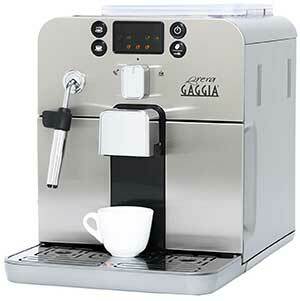 The Gaggia Brera coffee machine is a pleasant exception to this rule, utilizing a flat ceramic grinder. We’d have preferred to see a conical grinder in the machine, but understand the choice to implement the cheaper flat design, and certainly didn’t deduct any points in our scoring. The presence of a ceramic grinder in any form is a win for people shopping at the lower end of the price scale. Kudos to Gaggia for the addition. It serves the model well. One thing that’s a bit of a curiosity is that the grinder holds an impressive amount of beans (8.8 ounces! ), given its modestly-sized water tank. Normally, we’re not fond of mismatches like this, because invariably, the mismatch leads to having to stop in the middle of making coffee to refill one or the other. In this case, though, we can’t say we mind it as much. We have two reasons for this. First, the mismatch isn’t especially lop-sided, and second, if you like your coffee on the strong side anyway, then it virtually eliminates the size mismatch issue. Back to the grinder itself, it’s probably the single most important element of a super-automatic, because the grind you use can dramatically affect the flavor of whatever drink you’re making. For this reason, the more grind settings you have available, the better, because it allows you to dial into your preferred flavor, and everyone’s tastes are different. 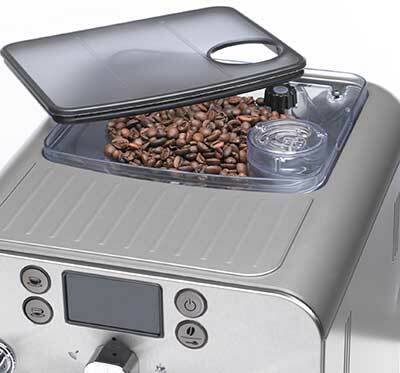 The Gaggia Brera espresso machine’s grinder gives you five settings. Coffee purists will be less than thrilled with that, but for most hobbyist and casual users, it’s fine. As a bonus, if there are times you’d rather not use fresh ground coffee, the Brera comes with a one-scoop bypass doser. Perfect for a late-night cup of decaf! Final note and this isn't unique to the Brera, but applies to super-automatics in general: The grinder doesn’t do well with oily beans. For best results, find a good Medium Roast you like and stick with it! 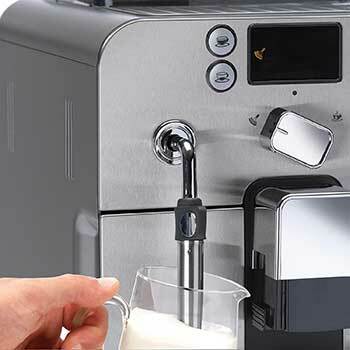 It probably comes as no surprise, but the Gaggia Brera fully automatic bean to cup machine only has one boiler. We prefer models with a double boiler, which allow you to simultaneously steam milk and brew coffee, but this is a feature you almost never find on value-priced machines and with good reason. Adding a second boiler would dramatically increase the price. As it is, Gaggia has taken steps to reduce wait time by incorporating Rapid Steam Technology, which minimizes the amount of time it takes for the machine to shift gears between brewing and steaming, which necessarily have different temperature thresholds. If you try to steam milk at the same temperature you brew espresso, you’ll ruin the milk. There’s just no way around it, The Brera’s solution is a good one, and we were impressed with its operation. Because the machine has such a small footprint, it probably comes as no surprise that although the coffee spigots do move up and down, they won’t accommodate larger cup sizes. On the Gaggia Brera fully automatic, your operational range is between 3.5” and 4.5,” so if you have a much-loved Jumbo-sized coffee mug, it’s likely that it won’t “work” with this machine. Sorry. This is the heart and soul of the model. The brew unit is what makes all the coffee goodness possible, and the control system, located on the front face of the machine, is the means by which you interact with it, customizing your drinks, attending to maintenance, and the like. 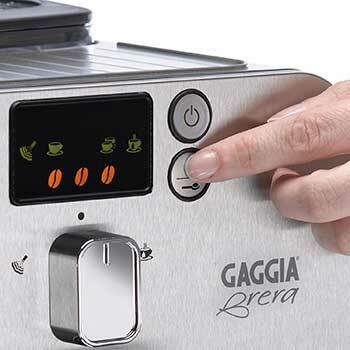 It shouldn’t come as a great surprise that a value-priced unit like the Gaggia Brera automatic coffee machine doesn’t use cutting edge technology, relying instead on a simple LED display. On a more expensive, full-featured machine, this could be problematic, because it’s very hard to design an efficient menu system for an LED screen. In this case, though, it works, because while the Brera has the basics covered, it doesn’t have a lot of extra bells and whistles, which means the menus are pretty simple overall. There’s nothing wrong with simple if it gets the job done, and that’s certainly the case here. Unlike a lot of machines, which give you the option to customize things like the auto-shutoff time, the Brera’s auto-shutoff defaults to one hour, and cannot be changed. ​Likewise, while you can customize various elements of your drink (the amount of water, coffee strength, and the like), you’ll find relatively fewer options. For example, most super-automatics give you five different coffee strengths to choose from, where this one gives you just three. That’s a trend you see repeated throughout the customization options available here. Again though, for a casual or hobbyist user, that’s fine, although purists will likely be disappointed by it. We would also like to mention here in our Gaggia Brera superautomatic espresso machine review that in addition to customizing your drink options, you can conduct various bits of automated maintenance from the menu, and if the machine needs something from you, it will flash the appropriate angry red icon on the display screen to let you know what it needs to get it back to its happy place again. Simple and effective. Where the brew unit is concerned, you can access it from the panel on the right side of the machine as you’re looking at it. It is removable and should be taken out and rinsed thoroughly about once a week. 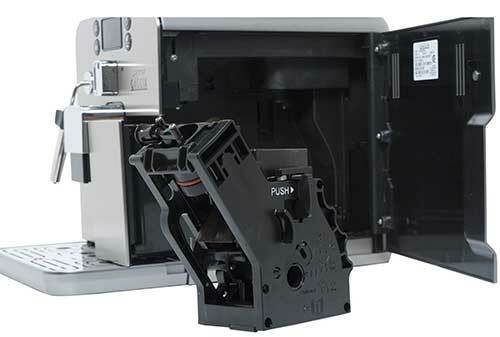 This is the part that scares casual users, and as such, it’s an important of our Gaggia Brera review. 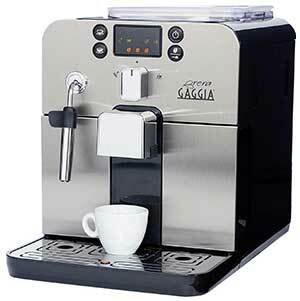 Rather than using an auto-frother, the Brera uses a traditional steam wand for steaming and frothing milk. Make no mistake, it does take a bit of practice to learn how to use the steam wand effectively, and the first three or four milk-based drinks you make with the Brera may not turn out as well as you’d hoped. Don’t get discouraged! Steaming milk is one part art and one part science, and with practice, you will get there! In fact, it is the presence of the steam wand that makes the Brera such an amazing machine, and once you learn to use it well, you’ll really appreciate it. The reason is this: Essentially, the Brera is an espresso machine, but that’s not a bad thing because espresso lies at the heart of just about every specialty coffee drink out there. Armed with a good espresso maker and a frothing wand, you can make an amazing array of great tasting drinks, and if you alter the water in your shot, you create Americano, Lungo, Ristretto, and more. While none of those are available at the touch of a single button, this machine gives you everything you need to make them, any time you want, and that’s fantastic. As a bonus, the wand also serves as a hot water dispenser, so you can use your machine to make tea, hot chocolate, and the like. We will explain here in our Gaggia Brera espresso machine review the difference between how espresso is made vs. how the coffee you’re probably used to drinking is made. If you’re new to the world of specialty coffees, then you probably arrived here from the drip-brew world. If that’s the case, then you’re used to drinking coffee by the pot, brewed by a machine that relies on gravity to feed the water through your grounds and into your waiting coffee pot. Espresso machines use pressure, rather than gravity, and that pressure is measured in bars, with one bar being atmospheric pressure at sea level. It takes 9 bars of pressure to make espresso, and the Gaggia Brera bean to cup coffee machine’s pump is rated at fifteen bars, so you won’t have any trouble getting world-class espresso from the machine, every time you use it. 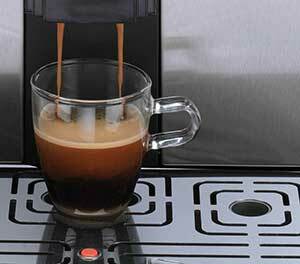 The Gaggia Brera does have a cup warming tray, and you should get in the habit of using it, especially if you’re coming to the machine from the world of drip-brewed coffee. The reason? Drip-brewed coffee is typically hotter. Specialty drinks were designed to be enjoyed at temperatures somewhat lower than you’re probably accustomed to, and brewing your coffee creation into a cold cup only makes the temperature lower. You can go a long way toward solving that problem by warming your cup before you brew, which minimizes heat loss. Try it both ways and see for yourself. You will be amazed at the difference it makes! Note that the warming tray does not have a dedicated heat source, but is heated passively by the boiler. There’s essentially no learning curve to this little machine, which is part of its beauty. You can pull it out of the box, set it up, plug it in, and enjoy your first specialty drink in a matter of minutes. Partly, of course, that’s because the machine is not encumbered by an abundance of features, but partly it’s just good design. That’s a win no matter how you slice it. We don’t have anything bad to say here in our review about the machine. Our one gripe had to do with the smallish size of the water tank, but that was a direct result of the design decision to create a smaller machine, and not a failure or oversight. Any improvements we’d recommend would only serve to drive the price up, which would put it in a different segment of the market, so honestly, we wouldn’t change a thing. It’s a great, basic machine, offered at a great price. 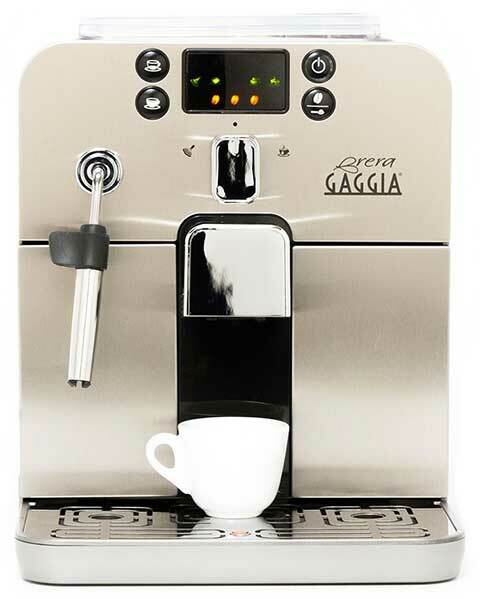 And that concludes our Gaggia Brera espresso machine review. While this machine isn’t one we’d buy for ourselves (the water tank being too small for power coffee drinkers), we readily admit that we love the model. It’s fantastic for people just beginning to explore the world of specialty coffee drinks, anyone on a budget, and casual or hobbyist users. The presence of the frothing wand will make purists nod appreciatively, although this is countered by the limited number of grind settings, so it’s only provisionally recommended for that group. All in all though, an impressive little machine! 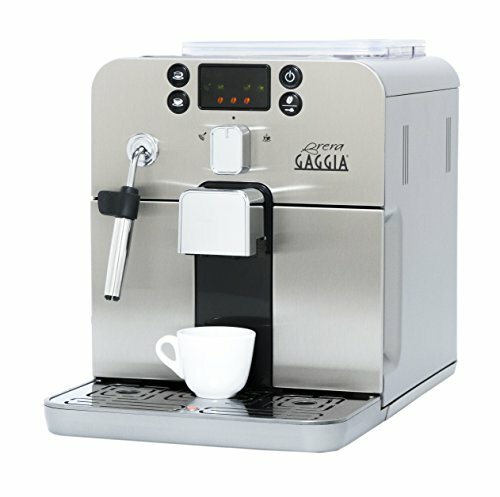 Gaggia Brera Forum. Badger & Blade. Gaggia Brera Refurbished Machine. 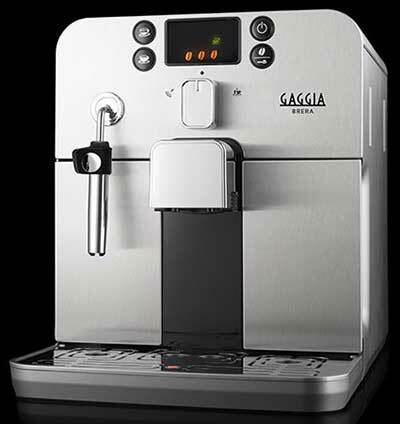 Gaggia Direct. Espresso vs. Brewed Coffee. Bunn. The Major Differences Between Foamed and Steamed Milk. Pure Bean.